​Disclaimer: I am very much a novice and experimenter. Most of what I have written below is NOT field tested. So read at your own risk! I'm recording this mostly for my own entertainment, but perhaps it will be helpful to someone else. I love to watch YouTube videos about all of this but I find that many of the experienced hands who do have a lot to teach guys like me accidentally make assumptions and use words terms that I am unfamiliar with so I'm often left guessing. I'm the same in the areas of technology I am experienced at so I'm not criticizing them. Kit with both Alcos and Fancee Feest, 6 oz. 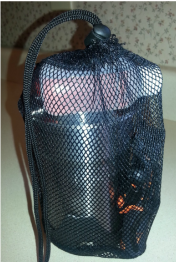 fuel, lighters nad windscreen in stuff sack. 2016-03-28 The Alocs burner is a bit more flexible than the Fancee Feest thanks to its snuffer/simmer ring and the fact that it can be carried with fuel in it, increasing your fuel capacity an ounce or so. And for another half ounce I could include the Fancee Feest and have backup! In addition, regardless of which pot I go with, we will still need at least two sporks and two cups for coffee or tea. We can either eat out of the freeze dried food packets or the cups. I like eating right out of the food bags as it makes cleanup a lot easier. At left is a stuff sack filled with the contents shown below and weighs just over 1.5 lbs. I like the redundancy of two stoves. It just might work. ​Is there no end to this foolishness!?! 2016-03-27 Had wonderful Easter Sunday services at our church. What a special day as we celebrate Jesus' resurrection from the dead which gives us hope. I hope you took time to pause and be amazed at God's love expressed through Jesus. 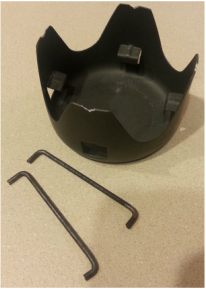 Assembled pot stand with Alcos stove inside. 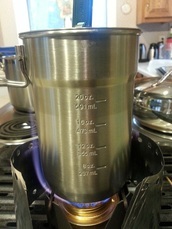 After lunch I was mulling over my cook kit/stove situation while watching a couple YouTube videos by Hiram Cook. In one he talks about the Stanley cook pot and cups that I got a couple days ago. And he discusses and shows a mod to the Alocs pot stand that allows you to use the Stanley pot with the Alcos stove. I quickly made the mod as shown in the photos to the right and the left. You simply file notches in the ears of the pot stand and then cut a couple heavy wires. I also chose to bend the ends as shown to keep them from accidentally falling off one end or the other. I used welding rod but a coat hanger or something similar would probably work. They fit across the top of the pot stand into the notches as shown on the left. With that done it was time to test it out. Pot stand with notches and bent wires. Stanley Cook Pot setting on modified Alocs stove pot stand. To test it I put two cups of cold water in the Stanley pot, lit the stove and set the pot on the modified pot stand as show here. 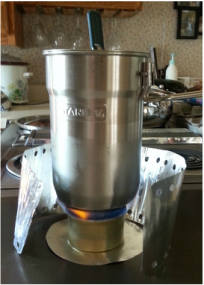 The Alocs stove brought the 2 cups of water to a rolling boil in about 6 minutes and consumed only a half ounce or so of fuel! 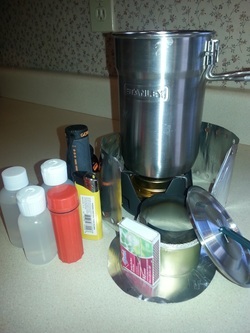 ​An assembled kit consisting of the Alocs burner with modified pot stand, wind screen, matches, lighter and 4 ounces of alcohol weigh in at 18 ounces, about four ounces heavier than the similar kit with the Fancee Feest. I also set the kit up to include the Alocs and Fancee Feest stoves. That including 6 oz. of fuel weighs in at 25 oz. Cook kit with Alocs and Fancee Feest stoves, 25 oz. 2016-03-24 My wife and I are planning a short backpacking trip to the Kettle Moraine area of Wisconsin not far from where we live. I keep mulling over what stove to take. I've pretty much decided we'll take all freeze dried or foods that only require hot water, as opposed to stuff that needs cooking. It seems either my Fancee Feest or Alocs (mini Trangia imitation) are candidates for the trip. So I got them both out for another boil test. Using identical water and room temperatures I started my stopwatch the moment I lit each one and measured the time to a rolling boil and the approximate amount of fuel. The Alocs required 9:30 to boil and about an ounce of fuel. The Fancee Feest came to a boil in 6:30 on about 3/4 ounce of fuel. It seems the Fancee Feest is the one to use. It also makes a somewhat lighter kit. ​I'll probably second guess this conclusion and try it again! 2016-03-26 Another question is cook pot, etc. Of course, there is no single answer. The above was done using my old anodized aluminum cookpot. It is what I have used for most of my playing around. I got it because it was "cheap". ​I noticed right away that its smaller diameter (about 3-3/4 inches) meant that the flames will somewhat come up the sides instead of hitting right on the bottom as they do with the older pot which is 4-1/2 inches in diameter. I'm guessing that the stainless steel also transfers heat somewhat less efficiently than aluminum, both together potentially meaning more time and fuel to heat. So, with about 1 ounce of alcohol in my Fancee Feest I did a boil test comparing the old pot and the Stanley pot. 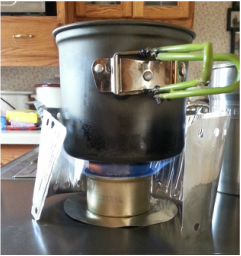 I was unable to use the Alocs stove with the Stanley pot because the pot slips inside the pot stand and sits right on top of the Alocs stove which I'm guessing is not the way things should be. So that played against the Alocs stove. Using the Fancee Feest it once again took 6:30 to get a boil with the old pot. However it took 7:30 to get a rolling boil with the Stanley cookpot, both with 2 cups of water. With the old pot I had maybe 1/4 ounce of fuel left while with the Stanley it was almost burned out. So The old pot is more efficient. 01/26/16 Today I received my Alocs (Trangia knock off) stove in the mail. So I decided to do a comparison of it with my Fancee Feest and my home made one described below. I used one cup of cold water from the kitchen faucet (60 degrees). The room temperature was 66 degrees. It took the Alocs six minutes to get a rolling boil. The Fancee Feest brought it to a rolling boil in 4 minutes and the homebrew just missed a rolling boil in 5 minutes by running out of the 1/2 oz fuel I gave to it and the Fancee Feest. Incidentally the Fancee Feest went on to burn a total of just over six minutes on its 1/2 oz. The Alocs used about 1.6 oz of fuel. I'm pretty impressed with the efficiency of the Fancee Feest. Back in June I ordered the Wick stove intro kit from Minibulldesign Cult.​ It is one of the cutest I've played with yet. The stove, pot-stand, integral hose and fuel connector weigh a total of two ounces making it the heaviest of the three that I have. I decided, since I was in the mood, to give it a try and compare with my homebuilt stove and the Fancee Feest stove. Water and container were the same, fuel amount the same. It took almost 11 minutes to get a rolling boil and the flame was almost out. So it burned about the same length of time as the Fancee Feest but seemed to put out less heat. One of its pluses is that the fuel is in a bottle and fed to the burner as needed through a hose by squeezing the bottle. The idea is that you can maintain a sustained flame over a much longer period of time. Clearly that is true. But I am not sure in the short run for just boiling water that plus is great enough to override the increased complexity of the system and the longer boil time, even if at the same fuel efficiency. Also you have to carry the outboard pot stand. 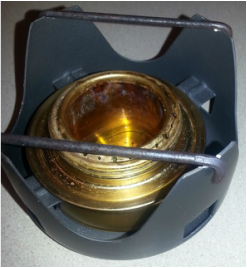 So I think for now the Fancee Feest is my backpacking alcohol stove of choice.